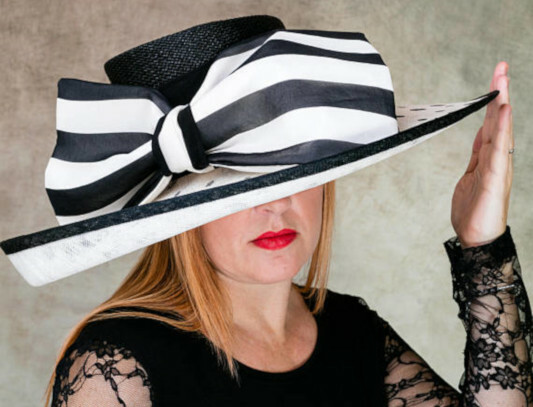 Kerry Kernan Millinery & Textiles offers a wide range of hats, fascinators, jewellery and accessories to cater for all events. Items are available to purchase ready made from the studio or why not come in for a personal consultation with Kerry and have something unique designed for your special outfit. Each item is created meticulously with a high level of finish, using the very best materials. Each piece of millinery is stitched completely by hand. Kerry loves all things classic and timeless but also loves to add a contemporary twist to her designs! Whether you are looking for a wedding, a celebration, the races, the regatta, a tea party or you simply need a touch of glamour in everyday life, Kerry prides herself on being able to design and colour match her accessories to compliment any outfit and thrives on the personal consultation approach with clients. A beautiful range of jewellery and accessories also make wonderful gifts and exquisite packaging will add the perfect finishing touch! Gift vouchers are available for items or workshops. Kerry also offers a range of workshops around millinery and decorative techniques. Please follow on Facebook to be the first to catch details of these or ask in the studio. The studio is open Wednesday through Sunday, 10-4. Mondays and Tuesdays are available for consultations, by appointment.